Everyone knows Robin Williams for his uncanny ability to fly from one topic to the next, from one character to the next and from one level of hilarity to the next. Over the years Williams has proven time and time again that he is still relevant, still talented and still hilarious. In 2001, WilliamsÂ graced the stage of Inside the ActorsÂ Studio with host James Lipton and gave aÂ five-hourÂ interview that has since become the most requested interview the show has ever had. And now Shout! Factory is releasing two hours of the interview (100 minutes is the originally aired interview, with an additional 40 serving as bonus footage). And from the first few minutes that Williams walks onto the stage, during which he wanders around improvising with the crowd and telling jokes as only he knows how, it’s clear why fans want to see this interview again and again. By the time Lipton gets his first question in almost five minutes have passed.Â But the truly amazing thing here is that it doesn’t feel like that long. With Williams keeping things lively and Lipton laughing as hard as the audience, it’s almost as if this episode is a Robin Williams stand-up special with a moderator. At one point Lipton asks Williams how his brain works and how he manages to move so fast. In answer, Williams asks an audience member for her scarf and proceeds to do five minutes of improv using only the pink scarf as a prop. 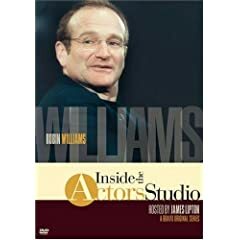 There are a few serious moments here, such as when Williams admits that he first started being funny in order to gain attention from his mother and that he started creating characters because he rarely had friends to play with, but for the most part this DVD is two hours of Robin Williams laying down comedy gold. As James Lipton informs viewers in the opening sequence, one audience member that night laughed so hard that he had to be taken away by an ambulance because of a herniated disk. And while most people won’t find themselves laughing hard enough to hurt themselves, this is one interview that is guaranteed to strike your funny bone. 2 users commented in " DVD Review: Robin Williams: Inside the Actors Studio "
Robin didn’t do this interview in 1994, the correct year is 2001. Good to see Williams still has “it”! Been watching him since the 70s.